Entries with tag geohazards . The GEP (Geohazard Thematic Exploitation Platform) Early Adopters programme is now welcoming new institutions with their users to take advantage of the platform capabilities. Started in 2015 with 29 users, the GEP Early Adopters programme now includes 61 users and 54 different organisations from 19 countries, read more about this on the the GEP blog. Users interested in geohazard analysis, GEP tools and the related products are invited to visit the Geohazard Portal. The Copernicus Sentinel-1 twin radar satellites combined with cloud computing are monitoring Europe’s earthquake zones by searching for ground shifts as small as a millimetre. Radar was developed in the last century to pick up aircraft moving at hundreds of kilometres per hour. Today’s satellite radar can reveal otherwise invisible shifts in the ground taking place as slowly as the growth of your fingernails. The new, automatic radar service covers Europe’s seismic regions, monitoring an area of three million square kilometres in 200 m blocks. Once any motion of interest has been identified, more detailed checks can be made through ESA’s Geohazards Exploitation Platform. “The quick-browse service has been under way across European tectonic regions since January, harnessing automated processing developed by the DLR German Aerospace Center,” explains Fabrizio Pacini of Terradue, overseeing the Platform. The GEP is one of six ‘Thematic Exploitation Platforms’ (TEPs)' being developed by ESA in the frame of the Earth Observation ground segment evolution strategy. The TEPs aim at fostering the exploitation of EO data by providing an online environment for users to access information, ICT resources, and tools. 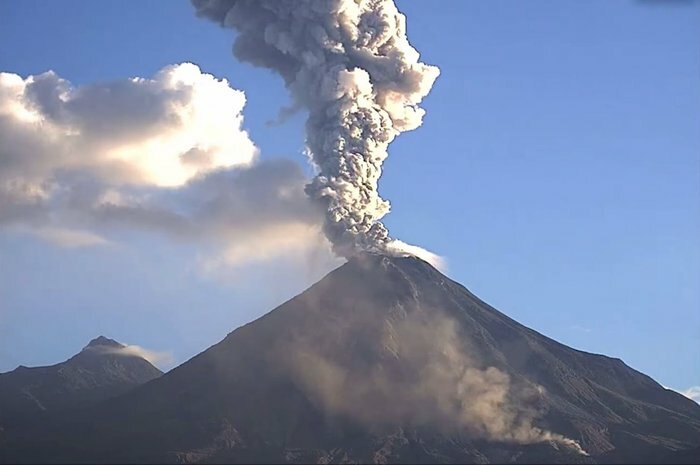 As hundreds flee lava and ash spewed from Mexico’s Colima volcano, its continuing eruption is being tracked not only by ground instruments but also from space. Starting last month, Colima is one of 22 active volcanoes worldwide being monitored by satellites. The latest observations by Europe’s Sentinels and the US Terra and Landsat satellites are being processed automatically for the rapid delivery of key parameters to geohazards researchers. “Within the geohazards arena, this kind of systematic service is really something new,” explains Fabrizio Pacini of Terradue, which operates the new service through ESA’s online, cloud-based Geohazards Exploitation Platform, or GEP. The service is based on automated processing chains developed by GEP research partners, running on the GEP itself, then made available through it. The Geohazards TEP is providing access to EO data collections and to processing results produced by services hosted on the platform. Following the request from INGV, the GEP is providing access to EO data from CEOS Contributors to authorised users. See first collections of ALOS-2 as well as Sentinel-1A and 1B data. More datasets from Pleiades, Sentinel-2, Radarsat-2, TerraSAR-X and COSMO Skymed will follow soon, as well as results generated by GEP partners. The interferogram created by INGV using Sentinel-1 acquisitions of 14 and 26 August. The product was generated using the DIAPASON chain of the French Space Agency, CNES. DIAPASON is one of the hosted processing chains of the GEP. Sentinel-1 T117 co-seismic interferogram (wrapped) of Amatrice earthquake (Italy), using Sentinel-1 acquisitions of 15 and 27 August. The product was generated by CNR-IREA using their own InSAR web tool, designed for exploitation on the Geohazards TEP and currently available as an initial prototype in ESA’s Grid Processing On Demand (G-POD) infrastructure. The Sentinel-1 mission flying under Europe’s Copernicus Programme offers a powerful system for monitoring surface displacement through the Interferometric SAR (InSAR) technique. It acquires Synthetic Aperture Radar (SAR) data on a global scale, and operates under an open and free data access policy. The satellite uses an Interferometric Wide Swath (IWS) mode to obtain the raw digital radar data about the Earth’s surface. Accurate and specific processing algorithms are required in order to turn this raw data into visual information products, and this layer of expertise can discourage users who are not familiar with InSAR techniques from using the data. To promote wider use of Sentinel-1’s SAR data, increase research on interferometric techniques and make it easier for people to produce accurate Sentinel-1 InSAR measurements, CNR-IREA has developed a web tool which, through a user-friendly interface, enables users to generate interferograms in an automated and unsupervised way (see Figure 1). With this service, users can select SAR images from the Sentinel data repository, set a few processing parameters, and then automatically process imagery and retrieve the interferogram which shows the changes in the surface area detected by the radar. CNR-IREA developed its InSAR web tool in the context of the Geohazards Thematic Exploitation Platform (Geohazards TEP). Designed for exploitation on the Geohazards TEP, the web tool has been available to users from the geohazards community since April, as an initial prototype in ESA’s Grid Processing On Demand (G-POD) infrastructure. The prototype will evolve into a pre-operational service on the Geohazards TEP by early 2017. The map (interferogram) shown in the image represents the Earth’s surface displacement induced by the Mw 8.3 Illapel (Chile) earthquake of 19 September 2015. The interferogram has been generated by exploiting two Sentinel-1 images acquired before and after the event, respectively. Each colour cycle corresponds to a displacement of about 2.8 cm. Today we are opening an online survey to involve more parties from research, industry, administration and government authorities in the evolution of the Geohazards Thematic Exploitation Platform (GEP) services. GEP is an R&D activity developing a new ground segment operations approach, complementary to the traditional operations concept, and demonstrating the benefit of new technologies for large scale processing of EO data. The platform is intended to support initially the global geohazards community’s objectives, as defined in the context of the International Forum on Satellite EO and Geohazards, organised by ESA and GEO in Santorini in 2012. In particular, GEP is a follow-on to the SuperSites Exploitation Platform (SSEP), an ESA initiative to support the Geohazards Supersites & Natural Laboratories initiative (GSNL) of the Group on Earth Observations (GEO). GEP allows both on-demand processing for specific user needs and systematic processing to address common information needs of the geohazards community as a whole, as well as massive processing on multi-tenant computing resources on the Cloud. Such capacities will address the challenges of monitoring tectonic areas on a global basis, and of studying a range of geohazards. To exploit the geo-information generated using the Platform, GEP leverages open APIs for the integration of interactive processing and post-processing services. The Platform follows a model for partnership and community building that is user driven. Fundamentally the current solution has been designed from working on user requirements from the GEO initiative on Geohazards Supersites and the CEOS Working Group on Disasters, with its Seismic Pilot involving a range of expert users such as for example the University of Leeds for UK’s COMET, ISTerre for the french Formater network, the italian Istituto Nazionale Geofisica & Vulcanologia, UNVACO, or NASA/JPL and University of Miami in the USA. National & regional civil protection agencies and national & local authorities with a risk management mandate (potentially for both prevention/preparedness and response). This process allows the GEP consortium to design functionalities able to meet prioritized user needs in view of efficient and cost effective operations. The programme of work covering the period 2016­-2017 will pursue activities with the Platform’s early adopters and will evolve the 16 processing applications currently available to exploit conventional and advanced InSAR processing for precise motion monitoring. The activity will develop six Pilot projects to demonstrate the potential of federated processing of EO data on the Cloud: a new pilot on photogrammetric processing using optical EO data with Univ. Strasbourg (France), the integration of optical based processing method for volcanic hazard monitoring with INGV (Italy), a pilot on terrain motion surveillance with CNR-­IREA (Italy), the systematic processing of Sentinel­-1 interferometric quick looks with DLR (Germany), the integration of a PSinSAR chain for precise terrain motion mapping with Altamira Information (Spain) and an exercise with the Corinth Rift Laboratory to test and exploit the platform processors and services to support geohazards science in this seismic part of Greece. In this course, the GEP will expand its overall user base to gradually reach a total of 60+ registered user applications in 2017. This growing user community is a key aspect for the GEP consortium so we have created an online questionnaire to involve more parties from research, industry, administration and government authorities in the evolution of the platform’s services. You have now the opportunity to contribute your needs and expectations in terms of functionality enhancements, use scenarios, services portfolio, data provisioning and concrete benefits for the GEP users. It will be open from the 1st to 21st of March, 2016.